My alarm went off at the ungodly hour of 4am. I groped blindly in the dark for it, then hit snooze. A few more minutes. I need just a few more minutes of rest, or sleep, or something. A delay, anything would do. Unfortunately, I needed to get up, have breakfast, and get out to the start line by 5:30am. The last stage of the ENDURrun, the marathon, officially starts at 7:30am. But this year there's a cut-off time of 4 hours and 30 minutes, and anyone that thought their race would be longer needed to start at 6:00am. Normally, I'd have been a 7:30am starter. The last time I did the Ultimate, I ran the marathon in 4:25. But this year my training was very inconsistent, and judging by how beat up my legs felt, I decided to err on the side of caution, and start early. I was not the only one; a total of 17 people showed up to start at 6:00am, mostly Ultimate competitors and a few single stage runners. It's pretty dark at that time of the morning. I'm not a morning person, and am never up at this hour, but I must admit it was kind of cool. Everything is quiet, dark, and very peaceful. Nothing is stirring. Also, since we were out in the country, we could see a lot more starts than you can in the city. The skies were clear, and Jupiter was clearly visible. Just before start time, Lloyd gathered us all together and did a roll call. Some quick last minute words of encouragement, and we were off! 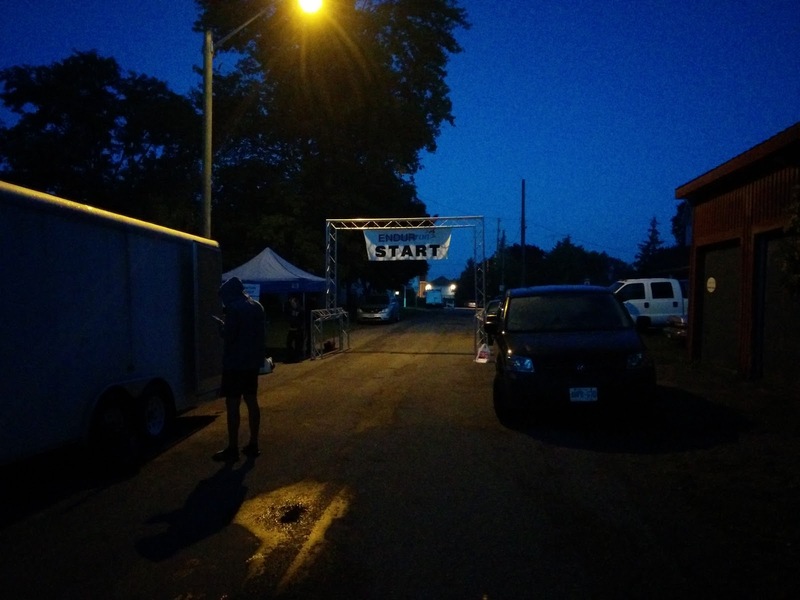 Despite the early start, the course was clearly marked with kilometre signs, and full service water stations. Even the photographers (Julie Schmidt and Jeff Wemp) were out on the course, taking pictures of us slow pokes. Did I mention that the volunteers were THE BEST? 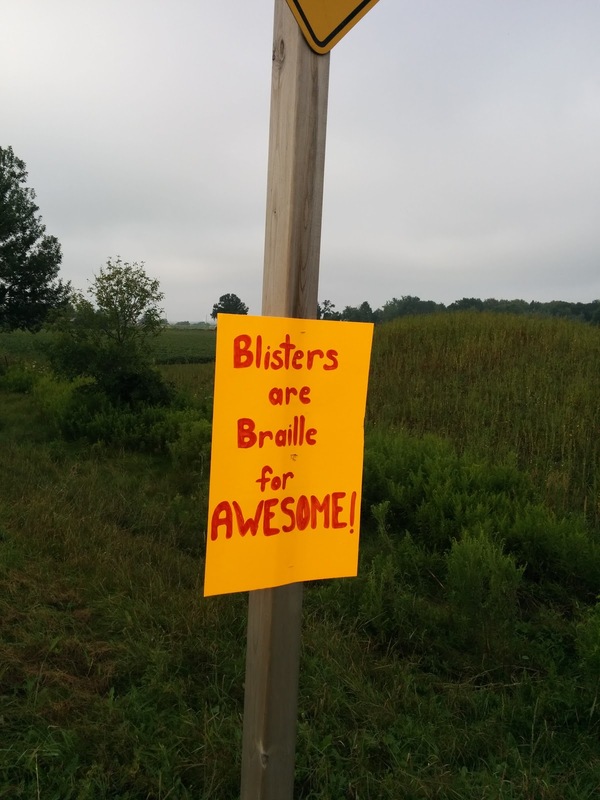 One volunteer, Carol, and her family, even went around and put up motivational signs on street posts along the route. They were hilarious, and certainly took my mind off my troubles albeit momentarily. Throughout the course, they'd drive by the runners and she'd hold out a funny sign for us. Talk about the personal touch! This one in particular made me laugh out loud. My plan for the marathon was to get through it. No time goal this time around. If I were to predict a dream time, it would have been 4:30. But really, any time before 5 hours would have been good. I could tell that this was going to hurt a lot. From the very first steps, my legs were super sore and fatigued. Susan, one of the other Ultimate runners, talked to me and we decided to start the race running together. We ran the marathon together 2 years ago, and had a great time. She was coming off an injury and only had 4 weeks of training, so she didn't know what to expect. She'd made it through the week relatively unscathed, but was nervous about the distance. She said she would walk the big hills, run the rest, and take walk breaks through the water stations and whenever necessary. I liked the plan, so we started together. We also picked up another Ultimate competitor, Jodi, who was also running her 5th Ultimate, and also unsure of what the day would bring. The first few kilometres were okay. We managed to keep up a 6:00min/km average pace, and walked through the first water station. At the 8km mark, I was having difficulties with my right leg. The whole quadricep muscle was going numb, like someone had shot it up with an anesthetic, or it was asleep. I slapped it, and I couldn't feel it. Weird. 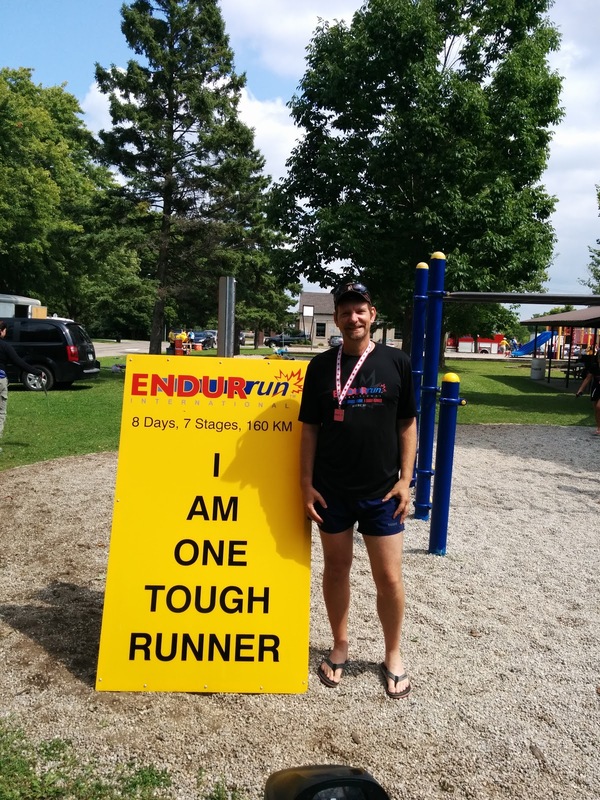 I'd had this happen before, also in the marathon at the ENDURrun, but it didn't happen this past spring. I'm not sure where it's coming from, but my suspicions are that it's due to the fact that my legs are tired. I'm not lifting them anymore, since I have no strength, and I'm pounding them harder into the pavement. As a result, the muscles are going numb from the increased shock. I'm not sure why it's always my right side and never my left, but it's really the only thing that seems logical to me. When the discomfort got to be too much to bear, I stopped for a walk. After a minute or two, the numbness would dissipate, and I started running again. Within a few kilometres, it would be back, and I'd have to walk again. I knew then, that this would be a really long day. 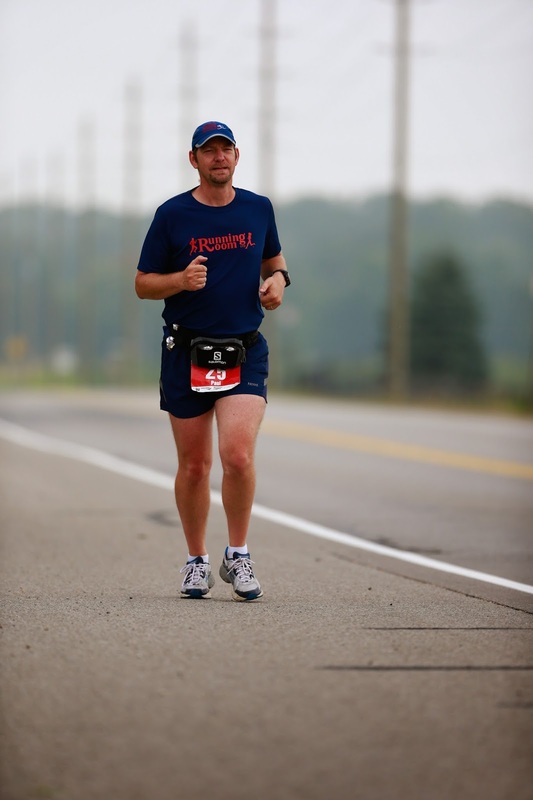 The ENDURrun marathon is two identical loops of 21.1km. The course itself is fairly challenging, with it's shares of hills, both rollers and a few steep and long ones. But mentally, I've always enjoyed this course. I think it's because once you do the first half, you know exactly what's in store for the second half. There are no surprises. Also, we've already done two stages with multiple loops (stage 3 with 6x5km loops and stage 5 with 5x5.2km loops), so doing 2x21.1km loops doesn't seem like that long a way. Another issue that plagued me on the first loop is a bathroom stop. I think due to the early start, and me sleeping in a bit longer than I should have, I didn't have time to do a full bathroom stop before the start of the race. Thankfully there was a porta-potty on the route, at the 12km mark, so once I reached it I made use of it. Not a big deal time wise, I only lost maybe 3-5 minutes. The run/walking persisted throughout the first loop and into the second. I finished the first loop in 2:35. If I continued this way, I'd be well on the way to a 5 hour marathon. While my dream goal was gone, I wanted to make it in under 5 hours, more as a sign of pride. Last year I ran the Sport competition under less than ideal circumstances (wedding, 4 hours sleep prior to the marathon), and came in at 5:13. That was by far the worst marathon I'd ever run. I desperately wanted to come in under 5 hours. About half way through the second loop, the fast runners that started at 7:30am started to pass me. First two guest runners blew by me very early. Then, at about the 30km mark, the lead Ultimate competitor came by. Still I pressed on, legs getting more and more tired, and the numbness coming more frequently. I resolved to just hunker down and get through it. As long as my leg didn't fall of, or I didn't shatter a bone, I was going to finish the race. By now the sun had come out, and it started to get quite hot. One advantage to starting at 6:00am was the temperatures; they were around 13 degrees, perfect for running. But now, they were climbing, and the sun was beating down. More walking, less running. Finally, after what seemed like an eternity, I turned the second last corner. At this point I was using landmarks as markers for when the running or walking would start. Just get over the bridge, and walk to the 5th pole. Then run to the hill, power walk up it, and run down to the sign. Walk to the driveway, then run again to the next sign. That's how it went, until the last hill. With less than 1km to go, I vowed to run it in from there, and I did. The ENDURrun puts out the finishing line tape for every runner, so you can feel just like the elites do that come in first. Another classy touch. I stopped my watch, and saw that I finished in 4:57, achieving my goal of sub 5 hours. Lots of high fives, hugging, and elation followed. I had completed my 5th Ultimate competition, and I was, yet again, ONE TOUGH RUNNER! Post race ritual is to (a) eat the awesome food the volunteers prepared, (b) sign the posters that every Ultimate finisher receives, and (c) gather for the award ceremonies. I'd mentioned that the swag for this race was excellent, and the finisher swag is no different. 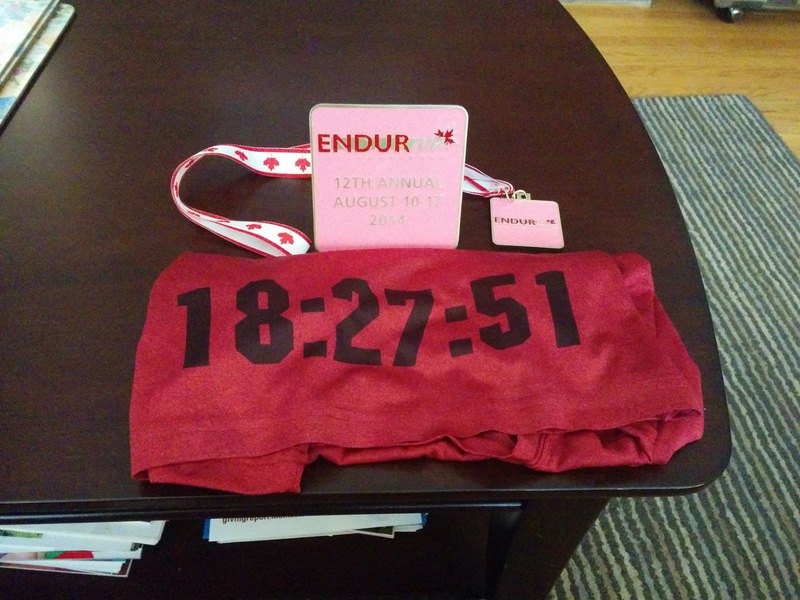 We each got a pewter plaque with our cumulative time on it, a finisher's medal, a poster, and a technical t-shirt (yes, ANOTHER shirt) with our finishing time silk-screened on the back! How cool is that?